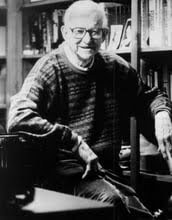 Born in Massachusetts on this date in 1925, Cormier started writing in elementary school, had his first work published in college, and was an award winning journalist for his hometown paper, The Fitchburg Sentinel, before testing the waters as a Young Adult author. His first effort Now and at the Hour was a major hit and was followed with a long string of successful books, including the multiple award-winning I Am the Cheese and We All Fall Down. His books have often been cited as “classics” for young adult readers. Cormier (who died in 2000) was honored by the American Library Association for creating a body of work that provided young adults with a window to view the world and help them to grow and better understand themselves and their role in society.